SodaStream's down but not out. This soda stock could pop yet again. 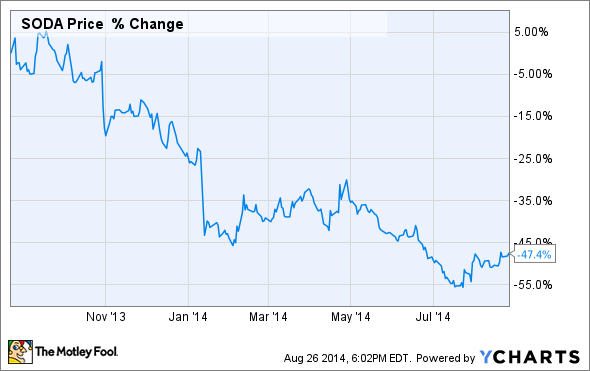 The at-home beverage maker SodaStream (NASDAQ:SODA) can't seem to catch a break. Its stock has lost more than 30% of its value so far this year, and there's reason to believe this free fall could continue. But investors (including myself) need to consider both sides of the coin. The do-it-yourself soda market is in flux. Less than a year ago we were still debating whether this so-called "fad" would wear thin, but now the biggest name in beverages, Coca-Cola, has generally settled that argument. SodaStream's "Free" is a zero-calorie seltzer beverage that it believes will resonate with health-conscious consumers. Free will appear on U.S. retail shelves in the latter half of 2014. Source: SodaStream. America has a newfound appetite for healthier food and beverage options, and the latter is precisely where SodaStream plans to make waves. As evidence, consider that Americans are consuming fewer calories than we were four years ago, and fast-food outlets are feeling the effects of our shifting values. Meanwhile, the same developments are occurring in the beverage industry. According to the global consulting firm Deloitte, the number one "fundamental theme" in soft drinks centers around "Changing consumer beverage preferences, featuring a shift toward health-oriented wellness drinks." SodaStream plans to pounce on this trend by doubling down on its marketing of the "health and wellness" aspects of its products. And there's reason to believe it could succeed in setting itself apart from brands like Coke and Pepsi. For one, SodaStream's cola beverages contain no high-fructose corn syrup, a distinguishing characteristic versus Coke and Pepsi's marquee products. Secondly, SodaStream claims its colas generally have one-third the amount of sugar, calories, and carbohydrates of their rival store-bought competitors. What's more is that it has teamed up with recognizable brands in more health-oriented categories, including juice purveyors like V8, Dole, Ocean Spray, and Welch's. Thus far, SodaStream has struggled to find a sweet spot for its U.S. marketing campaigns, but a more focused message could be just the ticket. Across the board, the health and wellness trend is picking up steam, as pointed out a few weeks ago by the natural grocer Sprouts Market: "Studies today show that the most rapidly growing segment of Americans adopting healthier eating habits is primarily middle income consumers." If SodaStream can align its brand with this fast-growing movement, this could do wonders for its stock. As soon as Coca-Cola and Keurig Green Mountain debut their co-created Keurig Cold machine, many believe it will be game over for SodaStream. But Coke's entrance could have just the opposite effect. If the beverage giant catapults the at-home soda market into the spotlight through a well-financed marketing campaign, SodaStream could benefit, as well. There's room for more than one player in this industry. First off, SodaStream is the largest participant in the U.S. home soda market; but only 1.1% of households owned a SodaStream machine as of last summer. That's almost a blip on the radar, which means there's plenty of untapped opportunity. According to a Gallup poll in 2012, nearly half of Americans drink a glass of soda every single day. But only a fraction of those soda sippers benefit from the convenience of an at-home refill machine. The entrance of Coca-Cola will increase awareness around the do-it-yourself soda movement. It will lead to more shelf space for these products in stores, and will likely create a "buzz" among consumers that exceeds anything SodaStream could ever muster on its own. It will prompt consumers to debate the merits of the Keurig Cold's single-serve functionality against SodaStream's higher-volume containers. And the same goes for the carbonation process, the flavors, and the cost of regular use. Because there are limitations of Coke's machines -- including a lack of flavor customization and a single-serve refill pod -- there's reason to believe SodaStream can entice customers who find its machines better suited to their household needs. In short, SodaStream's not doomed if the Keurig Cold is a success. With the U.S. proving to be a soft spot for SodaStream in recent quarters, this could be just what the company needs to bring attention to the overall category. As they say, a rising tide can lift all ships. SodaStream has fallen out of favor among a certain breed of growth-hungry investors. But with its stock price cut in half during the past twelve months -- from $70 to roughly $35 per share -- this fizzy beverage maker is starting to look cheap. SodaStream's forward price to earnings stands at 18.3 today, which is roughly in-line with Coke's, at 18.6, or Pepsi's, at 18.7. SodaStream is in a very different place than either of these companies, but it is trying to go head-to-head with the beverage giants in an attempt to lure customers over to its products. That, in turn, is proving to be a costly activity that's taking a toll on earnings. In 2013, for example, SodaStream's sales and marketing expenses totaled $186.3 million, or roughly 33% of the $562.7 million the company generated in revenue. And if you read the company's annual reports carefully, you'll realize that a sizable portion of that marketing budget is being directed toward the currently lackluster American market: "As we intend to invest in increasing our active customer installed base, particularly in the United States, we expect sales and marketing expenses to increase in absolute terms." For value investors, this presents an interesting opportunity to evaluate. If SodaStream continues to hit a wall in the U.S., then perhaps the company could ratchet down marketing spend in this region. Should this occur, investors would be left with minimal growth in the Americas, but with a relatively attractive (and profitable) business model in the rest of the world. Revenue in Western Europe, for instance, increased by 31.4% in 2013, and this region is immensely more profitable than the U.S. for SodaStream: Western Europe generated earnings before tax (EBT) margins of 21% compared to the Americas' EBT margin of 6.2%. For now, SodaStream's earnings are taking a hit as the company plows money into advertising and marketing to amplify growth in the U.S. But this is masking the earnings power of the rest of the company. For investors less fixated on classifying SodaStream as a "growth" stock, this could be a value opportunity with room to run. SodaStream is standing on firmer ground than many onlookers give it credit for. In the year ahead, the at-home soda maker could benefit from a shift toward healthier sparkling beverages, and the entrance of Coke in a currently niche DIY drink industry. Meanwhile, SodaStream's built a reliable business model overseas that's overshadowed by a stagnant American market. As soon as investors see more than a fading "growth" story in SodaStream, the sooner they can position themselves to profit.